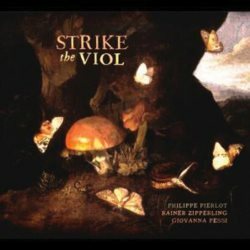 "Strike the viol, touch the lute, wake the harp, inspire the flute." That is the opening of an aria in Henry Purcell's Ode for the Birthday of Queen Mary (1694). That is where the title of this disc comes from. It is well chosen, as in England the viol - or viola da gamba - was one of the main instruments until the end of the 17th century. Although the violin enjoyed increasing popularity - John Jenkins was one of the first to play it - it was only in the last decades of the century that it started to overshadow the viol. In France composers wrote increasingly virtuosic music for the viol, and this resulted in the oeuvre of the likes of Forqueray and Marais. In England the most popular music for this instrument was the viol consort. The music for an ensemble of gambas was dominated by (imitative) counterpoint. That is also the case in the music performed here, mainly for two viols, often with an additional part for a plucked instrument. Discs on this label often come without a booklet, and that is also the case here. Moreover, the items on the programme are barely specified: in some cases the source is given, but there are no keys or any other clue which allows for their identification. This also makes it almost impossible to find out what the original scoring is. I assume that the parts for a plucked instrument are usually written for a lute rather than a harp. However, the harp was played in England: in 1629 a French harpist entered the service of Charles I as 'musician for the harp'. The most important music with a part specifically scored for the harp involved the harpe consorts by William Lawes. Giovanna Pessi recorded some of them on another Flora disc (review). John Jenkins was one of the most prominent and remarkable composers from the mid-17th century. He was held in high esteem, not only because of the quality of his music but also because of his character, described as "gentile", "well bred" and "complaisant". During his long life he experienced the political turmoils of the Commonwealth and the Restoration, but also the shift from the polyphonic fantasia to the baroque trio sonata. One could consider him the link between Byrd and Purcell. In a number of his compositions he added a basso continuo part, and it seems that this is what the role of the harp is in these pieces. The programme opens with a different piece from his pen: divisions on a ground. This was a highly popular genre at the time, and most close to the virtuosic music for solo viol written in France. The ground is a basso ostinato which is the foundation of a piece like this. As this is for two viols, imitative polyphony dominates. Virtuosity is also a feature of the divisions by Christopher Simpson - again not specified in the tracklist. This piece is taken from The Division-Violist, or An Introduction to the Playing upon a Ground, which was published in 1659 and was reprinted in 1665 under the title The Division-viol, or The Art of Playing Extempore upon a Ground. Simpson was one of the most prominent theorists and composers in England around 1650. To this category also belongs Tregian's Ground by Daniel Norcombe. For some years he was lutenist to Christian IV of Denmark, but fled to Italy and then settled in Brussels where he entered the service of Archduke Albrecht as a viol player. He remained there until his death. He composed many sets of divisions on a ground which circulated in manuscript in England. The second main composer on this disc, alongside Jenkins, is Matthew Locke. He was another leading figure in English musical life, especially after the Restoration. He was an advocate of traditional English music, in particular music for viol consort. Among his most important collections are The Little Consort and the two parts of The Broken Consort. The Duos for two Bass Viols comprise four suites, each consisting of two fantasias and a courante or sarabande. Two of these are performed here, but the tracklist omits the keys, so I can't tell which of the four. The programme is rounded off by two anonymous keyboard pieces played at the harp: The Bagpipes (from Elizabeth Rogers his virginall booke, 1656) and Good night. One thing which immediately struck me when I started listening is the brilliant recording. The transparency is such that the dialogue between the two viols in the very first piece and the various lines of the polyphonic texture can be heard in detail. The sound of the viols is completely natural and the fine dynamic shading comes off perfectly. You don't hear such excellent viol playing that often; this is one of the best discs with English viol music I have heard in a long time. The balance between the two viols is immaculate, and the harp is fully integrated into the ensemble. Add to that the fact that most of the music on the programme is not that often recorded and you will understand that this disc is not to be missed. It is just a shame that the documentation is so poor. Such an excellent disc deserves better.